"I stand here before you tonight, as your Congresswoman-elect, with many firsts behind my name." Supporters greeted Ilhan Omar's emotional victory speech with rapturous applause when the Democrat won Minnesota's fifth congressional district in November 2018. 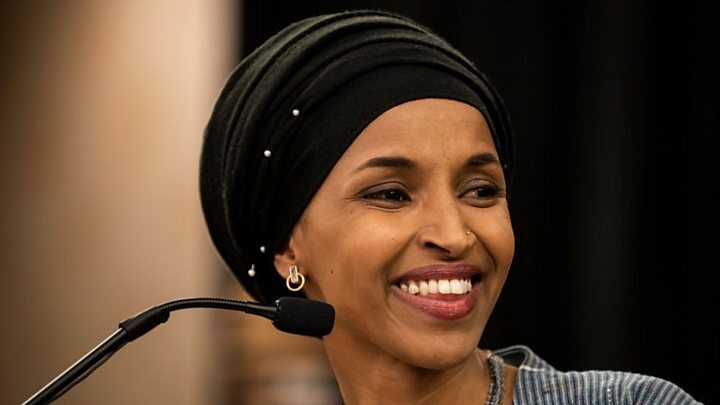 The 37-year-old mother of three is the first Somali-American, first African-born American, and one of the first two Muslim American women to serve in the US Congress. Ms Omar has drawn adoration and criticism since that election success as one of a new generation of young politicians shaking up the status quo in Washington DC. She recently clashed with the US envoy to Venezuela, in a clip that has since gone viral. But while she has won support for her approach on Capitol Hill, she has also faced repeated accusations of anti-Semitism, and even allegations of campaign finance violations in Minnesota. Ms Omar was born the youngest of seven siblings in Somalia's capital Mogadishu in 1981. Her mother died when she was two years old. Raised by her father and grandfather, the family fled the country during the Somali Civil War and spent four years in a Kenyan refugee camp before moving to the US in 1995. Originally working in education, she began her political career managing city council campaigns and working as a senior policy aide for Minnesota politicians. In 2016 she won election to the state's legislature - unseating a 44-year incumbent in the process. Ms Omar told the BBC in a 2017 interview that young people who "believed more in my platform, my ideas, and the merit of what I stood for" drove her to run. "A lot of the elders and mainly the women in the community thought it would be better... if I took a back seat," she said. What do her fans think? "A refugee girl came here and achieved the American dream," Somali refugee Awmam Mahdi told the BBC. "I think it's very positive for everyone who is an immigrant," the Ohio resident said, calling her a "role model". Ms Omar supports policies like greater healthcare coverage, more background checks for gun buyers, and abolishing the Immigrations and Customs Enforcement (ICE) agency. During her victory speech she gave a powerful rebuke to the Trump administrations immigration stance, declaring: "Here in Minnesota, we don't only welcome immigrants - we send them to Washington". The president had previously told Minnesotans Somali immigrants there were "spreading their extremist views" and joining the so-called Islamic State group. She drew praise for fighting to change a 181-year ban on headwear in the House of Representatives, allowing her to wear a hijab for her oath of office, and holds a place on the House Foreign Affairs Committee. Politicians and analysts have identified her with of a number of young Democratic politicians disrupting the status quo on Capitol Hill. Both 29-year-old Alexandria Ocasio-Cortez and Palestinian-American woman Rashida Tlaib - one of the first Muslim women in Congress, alongside Ms Omar - were also elected in November 2018. Ms Ocasio-Cortez tweeted her support for Ms Omar after a testy exchange with US special representative for Venezuela, Elliott Abrams, went viral. During a House Foreign Affairs Committee hearing Ms Omar brought up Mr Abrams role in the Iran-Contra scandal, in which the US secretly sold weapons to Iran and funnelled the proceeds to Nicaraguan anti-Communist groups. She also questioned Mr Abrams comments on US policy in El Salvador, including when he seemingly downplayed a massacre in the town of El Mozote in 1981. "Watching her question Trump's envoy... feels like justice," Ms Ocasio-Cortez wrote. Mr Abrams called the exchange "ridiculous" and said he would not respond to a "personal attack". "I don't think this entire line of questioning is meant to be real questions and so I will not reply," he said during the hearing. But for all her fans, Ms Omar has not had the easiest start in Washington DC. She has been repeatedly embroiled in controversy over remarks critics have called anti-Semitic. A 2012 post of hers resurfaced in which she claimed Israel had "hypnotised the world", provoking outrage for what many saw as an offensive characterisation of Jewish people. The controversy deepened when she attacked the American Israel Public Affairs Committee (AIPAC), claiming the lobby group is paying politicians to vote for pro-Israel policies. Republicans and Democrats condemned her comments. House Speaker Nancy Pelosi attacked Ms Omar's "prejudicial accusations" and demanded an immediate apology. She later did so, tweeting a statement saying she had colleagues "educating me on the painful history of anti-Semitic tropes". But the controversy continued when Ms Omar, speaking at a Washington DC event in March, questioned what she termed "the political influence in this country that says it is OK for people to push for allegiance to a foreign country" - in reference to pro-Israel lobbying. People from both parties again criticised the remarks, saying they played on anti-Semitic tropes of Jewish Americans having divided loyalties - though Democratic presidential candidates Bernie Sanders, Kamala Harris and Elizabeth Warren all spoke out in her defence amid the furore. Mr Sanders in a statement said people should not "equate anti-Semitism with legitimate criticism of the right-wing, Netanyahu government in Israel". President Trump has called on her to resign from Congress and "certainly" from the House Foreign Affairs Committee, calling the congresswoman "terrible". Ms Omar wrote a tweet in response, saying: "You have trafficked in hate your whole life". "I learned from people impacted by my words. When will you?" 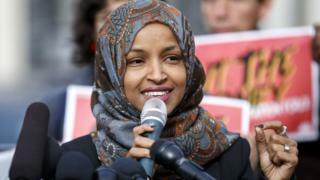 Ms Omar, like her colleague Ms Tlaib, has also previously expressed support for the pro-Palestinian Boycott, Divestment and Sanctions (BDS) movement, which urges a complete boycott of Israel over its policies towards the Palestinians. Israel says BDS opposes Israel's very existence and is motivated by anti-Semitism. But investigative journalist Alex Kotch, who wrote an opinion piece in The Guardian after Ms Omar's comments, argues that her criticism of AIPAC and support for the BDS movement are justified. "What she did in calling out AIPAC is an important thing," he told the BBC, saying it is "almost forbidden" to say anything critical of Israel in US politics and that Ms Omar was exercising her right to criticise a powerful lobby group. "We have to be able to distinguish between real anti-Semitism and criticism of Israel," he said. "Her critics are blowing this way out of proportion." And the campaign finance claims? Ms Omar's time in state government was not without controversy either. Minnesota Representative Steve Drazkowski alleges Ms Omar used campaign funds in her local election run to pay her personal lawyer, as well as to take multiple trips around the US and one trip abroad to Estonia which were unrelated to her election campaign. "She just doesn't respect the law," Mr Drazkowski told the BBC. The Republican lawmaker says both complaints are now under full investigation by Minnesota's Campaign Finance Board, although a spokesperson for the board told the BBC it does not confirm or deny any complaints or investigations. But Ms Omar told the local StarTribune newspaper that Mr Drazkowski has "an insane obsession with what is in my files". Her campaign at the time said Mr Drazkowski's allegations are politically motivated and told the Associated Press that "it should be concerning to his constituents that he is using taxpayer dollars to harass a Muslim candidate".